Folks from all over the world travel to Arizona in order to experience the raw beauty. 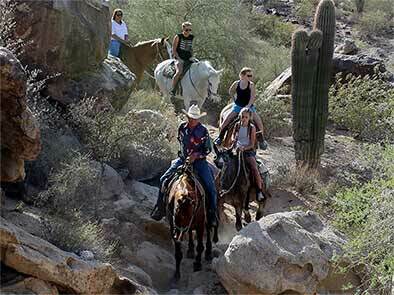 Many choose to explore the area on horseback and Arizona-Horses Ranches, Inc.Arizona-Horses was created in 1975 by Rex Ross Walker. Rex, a native of Texas, had developed an intense interest in horses and traveled to Arizona to spend time on a ranch. 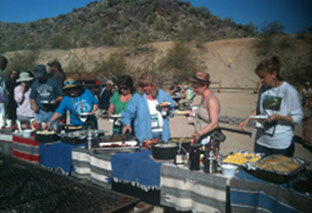 Arizona-Horses Ranches has activities for everybody. Whether you're young or old, whether you're an experienced rider or new to horses - you'll find a Arizona-Horses Ranches activity to enjoy! 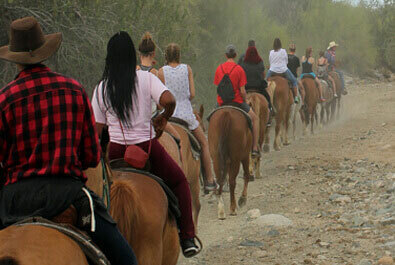 Join the fun of riding horseback through miles of scenic Arizona trails in the most spectacular country you can imagine. Join us on a refreshing morning trail ride and enjoy the crisp, clean Arizona air. Keep your eyes open for wildlife. The desert sky is brilliant blue as you ride through the arroyos and washes toward the summit of South Mountain. Slowly you rise in elevation, surrounded by beautiful desert flowers and towering Saguaro cactus. Desert rabbits and quail dart across the narrow, less- trodden trail passing through intricate rock formations, leaving the city of Phoenix behind. The air is clear and dry as you pass through the spectacular scenery of the Sonoran Desert. Phoenix sprawls across the valley floor as you view it from the quiet of the hills. You are in the desert southwest, experiencing it, and seeing it the way it was meant to be seen... on the back of a horse. Nestled in the foothills of South Mountain Park, the largest city park in the world, Ponderosa Livery Stable offers over 50 miles of trails criss-crossing through 18,000 acres of pristine Sonoran Desert. There's more adventure here than you can imagine, exploring the vast majestic beauty under the watchful eye of our guides and riding our first rate horses. Ponderosa Livery Stable is the only guided horse rental concessionaire in South Mountain Park. We look forward to serving our out-of-town guests as well as the residents of Phoenix. All of our rides are led by friendly and knowledgeable guides that will tell you all about the desert, its wildlife and the "Cowboy Way." You will get a REAL taste of the West and western life that you and your family, friends, or coworkers will talk about for years to come. Don't miss this unique opportunity! It doesn't matter if you are a single rider, family, or a large group, we have a ride for you. We have trail horses for every level of rider, from the first timer to the seasoned equestrian; we have a horse to fit your needs. We are currently planning for this years Monthly Special Events! 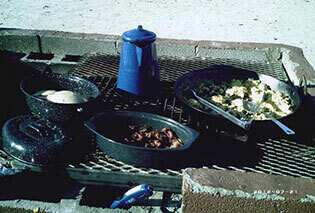 Ponderosa Stables offers Cookouts, Lessons, Boarding, and Special Event Facilities. I had a great experience on our dinner ride. The horses seem well cared for, the people are friendly, the views are spectacular and had a full moon which was amazing." It was great, our wrangler was wonderful and you gave us horses that matched our abilities. 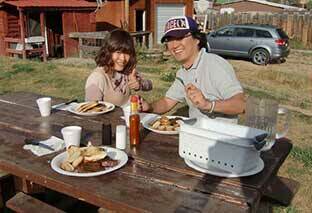 Your ranch is in a beautiful location and we will be back to do the tbone ride."